Designing your PowerPoint Presentation decks within a stipulated time-frame with quality is one of the common PowerPoint challenges. Without the right tools and apps to create a seamless process for making effective presentations in PowerPoint production, your projects will most likely fall way behind the proposed deadlines and come out as mediocre Presentations. To get the process flowing, you may be using different third party applications. For instance, an application for getting emails in place, another for storing files, and yet another for planning tasks and sharing ideas. But having them in so many locations is not a good idea and remembering passwords to these apps or where you kept them can be a nail-biting scenario especially when chasing the clock. What if we have all these apps in one location and one password to rule them all. 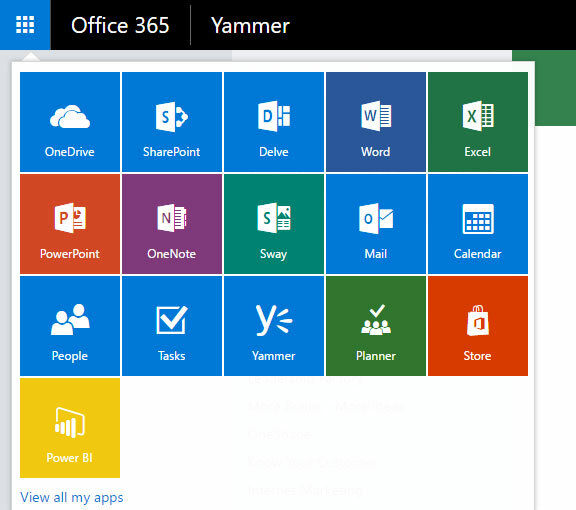 Yes, Microsoft Office 365 binds these apps in one place. It has all the necessary apps to make presentations quickly and efficiently. This will also aid in streamlining your PowerPoint Presentation Production Process. These are very basic but powerful apps that include SharePoint, Outlook, Yammer, Excel and PowerPoint Online. Here is a look at how each of the apps mentioned above helps the PowerPoint Presentation Design team at Chillibreeze to meet customer deadlines effortlessly. Here is a compilation of how we use Office 365 apps to achieve a smooth workflow that is a win-win. The first thing that starts the whole process is the customer emails describing requirements and their design expectations along with attached files. Office 365 has been equipped with Outlook for syncing all emails that can be sorted out in separate folders for organizing emails from different customers/organizations. 1. Tired of typing content from another source and opening a new item? : Copy any text to your clipboard (Ctrl+C), then press Ctrl-V in Outlook. Outlook creates a new message with the text already pasted. So instead of creating a new item in Outlook, and then copying and pasting text in, you do both in one step. 3. Access anywhere: You can easily access your emails through your phone with the Outlook app available on smartphones. SharePoint is where we store files, organize them according to our preference using folders and restrict access to users. SharePoint offers easy management, enhanced security, and access from almost anywhere. SharePoint can be accessed anywhere online. With SharePoint Online, your users can access their e-mail, documents, contacts, from any browser on any device from any internet connection. Store all files of a customer in the customer sites (workspaces) folder wise. Easy Maintenance: With SharePoint, IT managers can find relief in not having to perform backups, OS support, SharePoint patches, etc. By moving to SharePoint Online, your IT staff can free up hours that are spent on maintenance and focus on other important internal improvements which make everyone happy! Physical Security – Microsoft doesn’t disclose locations of their data centers, and provides multiple layers of physical security which include motion sensors, constant video surveillance, biometrics, and armed security at the data center. Encryption of data – Microsoft secures traffic with SSL over HTTP and use disks with BitLocker encryption. No data mining – Office 365 does not mine or access data for advertising purposes! Identity Protection – Office 365 demands strong user passwords and multi-factor authentication. Data Protection Agreement – Office 365 is willing to sign with all customers the standard contractual clauses formulated by the European Union (“EU Model Clauses”) . Additionally, it has become the only public cloud service to have implemented the meticulous set of logical, physical, process and management controls defined by ISO 27001. Here is the process of file sharing used when we execute a project or task for a customer. The customers are introduced to their own SharePoint workspace. When getting around with team workflow, we use the inbuilt Yammer app that makes internal communication a seamless interaction. How this app has made our team to work efficiently and quickly is an immense treasure in our daily work process. Groups : Set up a group for your team and work together with anyone across the company on projects, initiatives, ideas and events. Groups provide workspaces for a team by providing a central place for conversations, files, updates, and more. Collaborate externally : Add partners, customers to group conversations for specific input. For ongoing collaboration, create dedicated external groups or external networks to foster deeper relationships and a sense of community. These features helped us to share ideas in our particular groups, improving collaboration, productivity, communication, and ideation. Here are a few ways that we have been using Yammer that might show you how it can help you as well. You can update customer feedback on Yammer for the team to see their achievements or improvements. You can use Excel to store reports and have trackers to know the projects that are in progress, not started or completed. This is accessible online by team members with shared permissions. This makes editing and updating progress a transparent work system to whoever manages the Projects. Microsoft PowerPoint app extends the PowerPoint experience to the web browser, where you can work with presentations directly on the website where it is stored. Team members using the Microsoft online PowerPoint app can create, view, and edit files simultaneously. During View mode, click on the "Edit in Browser" button on the PowerPoint Online toolbar, to switch into online Edit mode. The PowerPoint online Editor is a browser-based editing platform, which enables users to work on documents without losing accuracy. To edit offline, you can click the "Open in PowerPoint" button on the PowerPoint Online toolbar which opens in the PowerPoint desktop app. The online PowerPoint app although with its limitations compared to the desktop app still provides some benefits for PowerPoint designers. Learn some of its main features and how they can help you increase productivity while working with PowerPoint. Online Collaboration: The Office 365 online app allows users to see what other team members are working on in the same project or workspace. You can see what they are typing in real-time and share the workload or work on different sections of the same project. You can chat with them by using Skype for Business which saves time and gets task done in a short period. Shared with Me: The Shared with Me feature helps you locate the files others have shared with you. After someone has shared you a presentation, that presentation will automatically appear in the Shared with Me list. Use Tell Me to quickly do things: You'll notice a text box on the ribbon in PowerPoint that says Tell me what you want to do. In this text field, you can enter phrases or terms of what you want to search for and get features you want to use or actions you want to perform. Screen recording: Need to show demonstrations to fellow users or customers, you can now include screen recordings in your PowerPoint presentation. Set up what you'd like to share from your screen, then go to Insert > Screen recording, then you can select a portion of your screen to record, capture what you require to share, and then directly insert it into your presentation in one seamless process. The whole process of receiving and organizing mails using Outlook, storing files in SharePoint, communication with the team through Yammer, creating reports with Excel and collaborating with team members using PowerPoint online app; and having these apps all in one place makes it a seamless process for any user to confidently create Presentations and concentrate on quality without worrying about completing deadlines. Have you heard about the latest Microsoft app, "Microsoft Team"? It's worth a try. What features or apps do you use to speed up your work process?